The Indonesia Australia Partnership on Food Security in the Red Meat and Cattle Sector (the Partnership) was developed by the Indonesian and Australian governments to combine their strengths to improve the red meat and cattle sector supply chain in Indonesia and to promote a stable trade and investment environment between Indonesia and Australia. Through the Partnership, Indonesia and Australia combine their strengths to improve the red meat and cattle sector supply chain in Indonesia and to promote a stable trade and investment environment between Indonesia and Australia. Interested in joining the Partnership team? Discover the latest recruitment opportunities now. The Partnership regularly publishes Call for Tenders inviting offers from suppliers to provide goods or services. Interested in joining the Partnership training program? apply now. Partnership members play an active role in overseeing and governing the Partnership’s program through Sectoral Working Groups (SWGs) of which there are currently three: Breeding, Processing and Transport/Logistics. 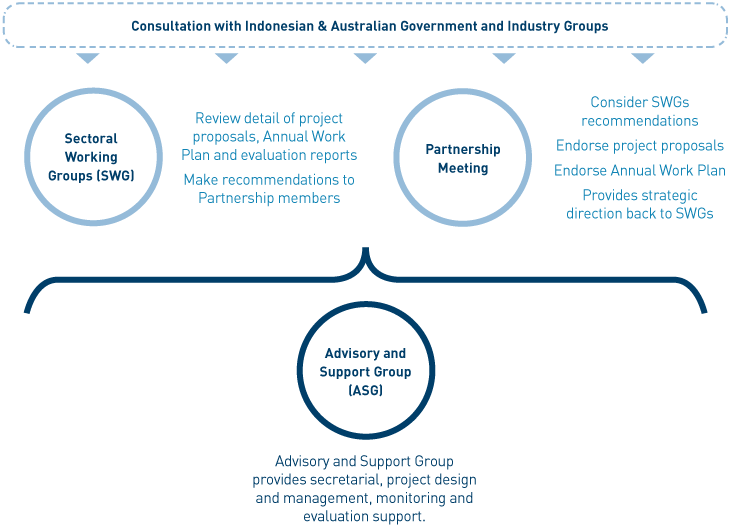 The SWGs work closely with BKPM and DAWR Partnership Secretariat, and are provided technical and facilitation support by the Advisory and Support Group (ASG) - the Partnership’s program management contractor. The Indonesia Australia Partnership on Food Security in the Red Meat and Cattle Sector is a Heads of Government initiative funded by the Australian Government. The secretariat and policy lead is the Department of Agriculture and Water Resources in Australia and the Indonesia Investment Coordinating Board (BKPM) in Indonesia.